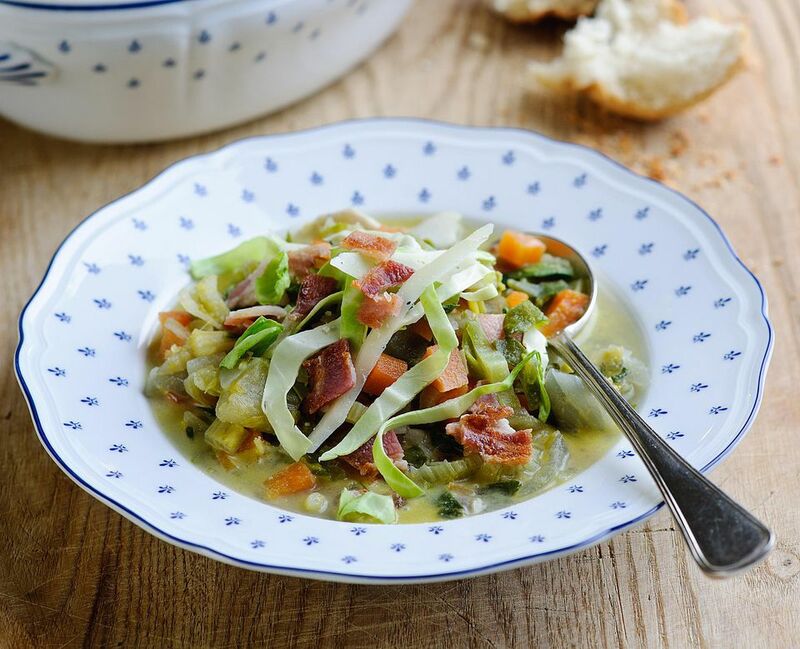 I am not sure whether this Sweetheart cabbage soup should also be called a stew, as it is packed full of delicious, hearty and healthy ingredients. The soup makes a perfect filling lunch, a starter for dinner, or a simple supper dish served with crusty bread, or perhaps by adding cooked rice (see the recipe below). Sweetheart cabbage is also known as Pointed, Hispi or Hearted and is a green cabbage, distinctive by the pointed, rather than round, shape. Sweetheart is a lovely cabbage for soups as it holds its texture and shape when lightly cooked which also makes it a lovely cabbage to use in stir fries or any other method of flash cooking. Heat the olive oil in a heavy soup pan. Once the oil is heated (but not over-hot and certainly not smoking), add the finely chopped shallots, the trimmed carrot, celery, the garlic and bacon or pancetta cubes. Stir the vegetables well to make sure they are all covered with the oil. Lightly season the vegetables with sea salt and black pepper. Add a few tablespoons of cold water to the pan, then cook the vegetables over a medium to low heat until they are soft; adding the water to the vegetables help to create steam, so the vegetables become soft rather than cooked. To make sure the vegetables do not crisp and burn, a little additional water if needed, and stirring. Once the vegetables are softened, add the sliced cabbage and the sage leaves. Mix well with the other veggies. Add the stock and bring the soup up to the boil, then lower the heat. Simmer for five minutes, by which time the soup will be cooked - approx five minutes. Check the seasoning and add salt and pepper to taste if needed. OPTIONAL: At this point you can add a little cooked rice to make this an even more sustaining dish. Add the cooked rice and cook for a few minutes to make sure the rice is heated all the way through. Pour the soup into warm serving bowls and then sprinkle with fresh Parmesan shavings on top. Serve with fresh, crusty bread and butter, soda bread is lovely with the soup. This soup is best eaten cooked fresh, it will keep for the next day but will not freeze. This recipe is based on one from Love Your Greens.